"When Grandfather Returns," by S.N. 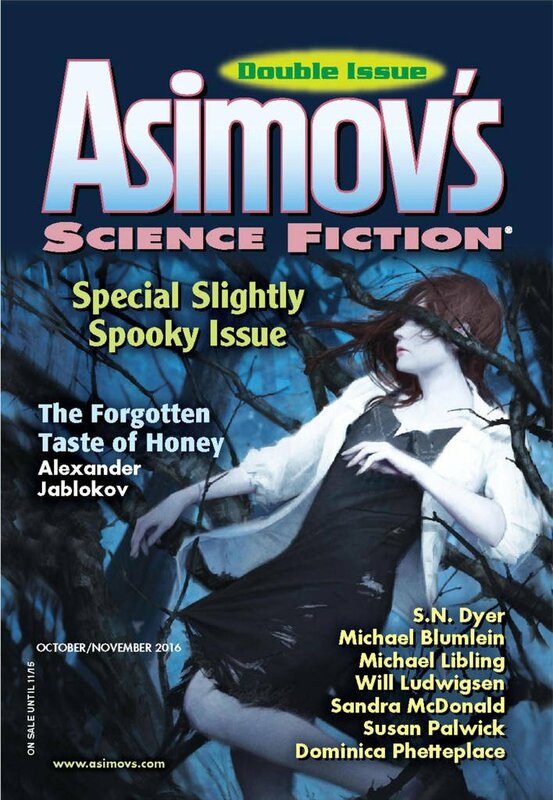 Dyer, appeared in Asimov's Science Fiction issue 10-11|16, published on September 22, 2016 by Penny Publications. Pro: Heat Lightening really does bring aid to his family, albeit 500 years later than expected. And Strong Horse does something meaningful with his life, right at the end of it, so both story lines meet and conclude together. It's ironic that Strong Horse realizes that the bones and armor of the dead conquistadors is worth more than gold. Heat Lightening didn't lead them to treasure--he turned them into it! The story is filled with beautiful symmetries: Heat Lightening was a willful child who was cast out of a normal life and became a magician and then a warrior. Strong Horse started off as a warrior (in WWII) and then became at the modern equivalent of a magician: a university professor. He ended up cast down into a normal life, burdened by a willful child. It's an amusing twist that the past reaches to the present, not the other way around. Con: It seems unlikely that Strong Horse could fool anyone into thinking he'd dug those bones up.